Sherwin maintains that the Greenlanders migrated westwards, and that's not really so unlikely. The sagas tell of several journeys to what was probably Newfoundland from the year 1000 and onwards, stories that were confirmed by archaeological findings in the 1960s. Although the size and duration of this presence as a whole is not determined, the Norse Greenlanders undoubtedly did visit America and made contact with the native tribes. 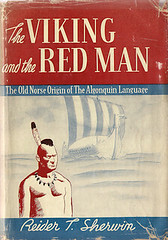 According to Sherwin, however, the Nordic visitors left behind more than just the few documented longhouse foundations and bronze tools: After the Greenlanders arrived en masse, he claims, they set about spreading their language to the extent that the native Algonquian population discarded whatever language they might have had before and adopted Norse instead! That is a very fascinating idea. Especially because it's absolutely, completely impossible. In any case, when the next wave of Europeans arrived in the wake of Columbus, still according to Sherwin, perfectly preserved Old Norse was spoken by dark-skinned natives across the north-eastern quarter of the continent. This in turn went unnoticed by the Germanic-speaking settlers up until some time probably in the late 1930s when a certain linguistic genius noticed similarities between Algonquian place-names and his childhood Norwegian. So Sherwin set about proving his hypothesis using that classic old method: Amateur comparative linguistics. But unlike the myriads who cherry pick their samples to reveal that English is derived from Hebrew, or Basque is actually Korean, and so on, Sherwin worked his way systematically through the complete known Algonquian lexicon. This book is no less than a meticulous attempt to prove that every single documented Algonquian word is one hundred percent identical to Old Norse. And what Norse! Because, honestly, to meet this end one of the two have to be ‘adjusted’. Sherwin claims to speak ‘the dialectal Norwegian’ (which is pretty much the same as Old Norse, he says. Spoiler alert: It isn't.) in addition to Swedish, German and French. No Algonquian, though, but that's probably not necessary, since he owns several dictionaries―Algonquian to Swedish, German and French―and these form the base of his research. Sherwin maintains throughout that he has no formal training in linguistics. But he believes so strongly in his discoveries that he constantly urges trained philologists to make use of his ear for language and extract further interpretations beyond his reach, such as when the Norsemen arrived, how many they were, and so on. So, we'll see about that. The book is laid out like an etymological dictionary of Algonquian, and in its very first entry Sherwin outlines how the word aazasit, meaning a glass, is derived from the Norse ausa-sit, meaning ‘one's ladle’. Well, there are some obvious similarities between a glass and a ladle, they both hold fluid. But is this enough for the two words to be interchangeable during the proposed assimilation process? That important question will have to wait, because my very first objection is that the word, or rather language fragment, ausa-sit (along with practically every other Norse construction in this book) is simply not Norse at all. Sit is, just like Sherwin mentions, a neuter gender. Ausa, on the other hand, is a feminine. The noun governs the pronoun, and as such they simply do not mix. The correct word (the feminine singular possessive pronoun) would be sin. And as in every other Germanic language, English included, this is not suffixed. So we're actually dealing with two words, not one. Secondly, as a singular possessive pronoun indicates ownership of one specific item, a definite article is needed. In this case that would be the suffixed article -an. So the correct Norse term for ‘one's ladle’ would be ausan sin―A detached accusative form. Sherwin's ‘word’ is invalid in several more ways than its English equivalent ‘ladle-one's’. In fact it's pure dictionary cut-and-paste, very much like today's automated computer translations. But let's for a moment imagine that all's well and ausa-sit is a real word, perhaps slightly corrupted by Algonquian tongues, excuseably unfamiliar with the finer nuances of Scandinavian grammar. A larger-scale question still begs an answer: If this word was not assimilated in its nominative indefinite―that is, ‘basic’―form, ausa, but rather a very intricate and seemingly random construction indicating several very specific situations... Why? Sherwin invites a cultural-historical interpretation of his discoveries to see what other facts they may hide. So let's dissect this very specific and very interesting word. The massively conjugated word form ausa-sit contains a lot of information about the ladle's current use, ownership and who owns it: First of all the reflexive pronoun indicates the accusative case, so the ladle in question is constantly the object of some action. Furthermore, the ownership is specifically the third person singular. This form seems randomly chosen among a myriad of possible ownership models. The many possible conugations are: First person: my ladle (ausan mín), our ladle (ausan okkar, ausan ór or ausan vár); second person: your ladle (ausan þín, ausan ykkr or ausan yðr) or third person in a variety of numbers and genders: her ladle (ausan hennar), his ladle (ausan hans), its ladle (ausan þess) or their ladle (ausan þeirra). Notice how none of these sound like aazasit. I think that also answers my initial question: Why was exactly this word form chosen as the new nominative? There are strong indications that it was not chosen by the Algonquians. It was chosen in retrospect by Sherwin. Let's have a look at the other possibilities. The Algonquians didn't produce glass, so this would be a new product to them, needing a new name from an outside language. So far, so good. Problem is, the Norse didn't produce glass either. They probably knew it existed, at least those who had traveled in Europe. Still, the Norse named their drinking vessels from the shape, not the material. So there are several Norse words to choose between: Koppr (cup), bolli (bowl), bikarr (beaker―notice how English actually is a close relative of Norse), hnappr (tumbler) and staup (chalice), to name a few. The list grows even longer if we include other liquid holders like bytta (bucket or tub), tunna (barrel), verpill (keg) or legill (bottle). Combine these with the numerous conjugation possibilities mentioned above, and there is a nearly unlimited number of words that are semantically just as close to aazasit as ausa-sit. Except none of them sound so convincingly alike―I think it's not random at all. Sherwin also comments on how both Algonquian and Norse use different possessive pronouns for body parts and any other belongings. I know such a noun class distinction does exist in some languages, I believe Vietnamese and perhaps also Algonquian. On the other hand, no Scandinavian language has ever used this system. I do not know whether Sherwin speaks good Algonquian, but he certainly lacks any basic knowledge of Norwegian. Today, Sherwin's books unwittingly cater to the surprisingly large movement of White Americans who seek to prove that Native Americans were not the first to arrive on the continent‒whether they were beaten by either early Whites or now-extinct paleolithic peoples. This movement's motivations are diverse and range from wanting special Native American legislation revoked, to pure and simple ethnic pride. The book also offers comfort to those Norwegians who look for a Norwegian influence in everything and anything. Also, I guess, a question of pride of some sort. Interestingly, both these camps argue that Sherwin's claims must be valid because of their enormous quantity. Supporters highlight the fact that he analysed a total of 15,000 words and phrases, expecting this monumental efford to speak for itself. This is of course based on the assumption that diligent workers are always right in the end. As much as one would like to think so, that is unfortunately not all there is to it. However, technicalities aside we can now start using this book the way it serves us best: To enjoy the fabulous nonsense for what it is. Because Sherwin did have a way with language―although lacking in talent and patience as a philologist, he would have made a great dadaist poet. I for one absolutely cherish his ability to produce funny-sounding words without meaning. Another favorite of mine is abookcheech, Algonquian for ‘mouse’. Sherwin attributes this to the Norse aa-buuk skyyt, ‘moves quickly on the belly’, or more precisely scooting around on its belly: A description that can only fit a mouse, right? Anyway, Sherwin's construction would in reality be an agent noun, and should go more along the lines of búkskriðari: something crawling around on its belly. Or just skriðari, ‘crawler’, as this verb already contains the belly aspect. The word for scooting (skjótast) is reflexive and doesen't really mix naturally with the agent endings. And last but not least: Although Icelandic has quite the reputation for inventive and descriptive words, the Norse for mouse is not ‘bellycrawler’, but―and don't act surprised now―mús. After all, we are dealing with phonetics, and if there should be any doubt as to the correctness of these translations, listen to a Frenchman say ‘AGAMG’ and a Norwegian say ‘AAGANG,’ and if you can detect any difference I'll eat my hat. Scientific proof, I love it! (Please don't ask where French came into the picture.) By the way, Norse for showshoe is þrjúgr. We have found so many references to the Norsemen, that we may well take it for granted that they were here a long time. It would be easy for a person sufficiently versed in the Old Norse language to determine the period of settlement of each district or tribe merely by looking at the words they use. (...) I am sure a philologist could determine to which historic period they belong. I have found so many words of rescent origin among the Micmacs that I am sure this is the youngest settlement. Narragansett Bay is the oldest. He's doing the job himself, so why call for authorised help? It should also be mentioned that Norse Greenlanders would not have identified themselves as Norwegians any more than Icelanders, Faeroese or the Norse-speaking peoples of the British Isles. While it's true that settlements can be dated through linguistic analyses of place-names (and it's often a very helpful supplement to the physical archaeology) that process requires a ready supply of background information for chronological correlation. Unfortunately, we know next to nothing about whether the Greenlandic dialect diverged from the well-documented written Icelandic Norse during the 500 years the colony existed. To Sherwin, though, these questions do not seem relevant. ... Treats Algonquian as one language, as well as the undefined ‘dialectal Norwegian’. 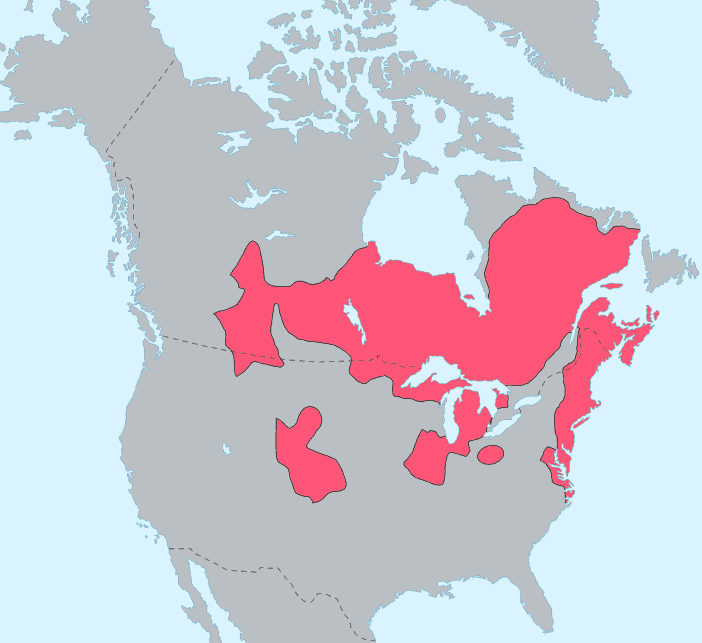 Algonquian is in reality a family of nearly 30 different languages, and Norwegian (a part of the larger North Germanic dialect continuum) consists of several dialects with very diverse phonetical patterns and vocabularies. Sherwin only sporadically specifies which of the Algonquian languages he is referring to, and never which Norwegian dialect he is supposedly familiar with. He also seems oblivious to the fact that Norwegian is substantially different from its 1,000 year predecessor Old Norse, and constantly utilizes words of a recent continental origin. ... He picks and chooses any grammatical constructions from either language (mainly based on the phonetics alone). Such a comparison between an agglutinative and an inflecting language makes no sense, since words and phrases are composed using two widely different systems. On top of this, the grammar in the provided samples is more often than not grossly incorrect, leaving us with aboslutely no actual correlation. ... He modifies words, both the sound and the meaning, to fit his needs. The modifications are done from secondary written sources without regard to semantic nuances, thus removing the meaning even further from reality. There is no attempt to map out or compare phonetical patterns. (Except for the odd promise of eating his own hat if people don't think it sounds the same.) Judging from his corrupted rendering of both Norse and Norwegian, drawn from presumably correct written sources, I also have strong doubts about his presentation of Algonquian vocabulary. In closing I'll list some selected highlights/personal favourites from volume one (to be honest, I didn't read the others) with a reality check to go with it. Line 2 is his compared Norse―both lifted verbatim from his works. Line 3 is the same Norse sentence translated to actual Norse. As you can see, real Norse is in most cases quite far from Sherwin's suggestions. 1. Toh-wutch hahanit: Wherefore does she laugh? 2. Taa vaarsh (a)haanan: Do you laugh at us? 3. Er þu að hlæja að okkr? 1. Tohshinoop askook oh: He lifted up the serpent. 2. Taa skyyn-upp aa-skakka: (Lifted) the snake up to the sky. 3. (Hann) lyftaði orminn til himins. 1. Atookwakun: A legendary tale, folklore. 1. Ne-bibina8tsak8ansi: I look at the mirror. 2. Me pippan aa skuggan sit: I look at my shadow. 1. Adagalea weese: To croak as a bullfrog. 2. Aeta gala viisa: Grandfather's chanting strophe. 2. Kykvan byy: To be sprightly. 1. N8ssikerdameskańgoun: I have sorrowful thoughts. 2. Uu-sigr doom sik angran: Not overcoming his sorrowful state of mind. 2. Hoegsta-byy geisi sjoe-kumme: To be the very largest sea basin. 1. Tsibeghihadighé: The mast (on a ship). 2. Skibe jaga laagan: Ship sail-mast. 1. Magańrask8andi: Shovel or scoop, to clear away snow. 2. Moka raskan: Disarrange by shovelling. 3. Moka is to dig or shovel, raska could mean the same in some constructions. Combining them makes no sense at all. 2. Soelve kommode: Silver chest. 3. Sølv-kommode is modern Norwegian (from non-Viking French) and would mean a chest of drawers made entirely from silver. A ridiculous idea! (Especially if you're a semi-nomad living in a barter economy society.) Also, note how you could just as well work the English word commodity into the Algonquian line 1. 1. Adumadeek: We two are arguing, disputing. 2. Aa-daema doom-gjafa: Endowed with arguing. 3. Neither the ‘Norse’ nor English makes any sense. 1. Sesoogwakudaaga: To ring (as a bell). 2. Suse kvaka taakn: Tinkling twitter sign. 3. I give up. These words contain absolutely no information on any level. They are only random sounds. So... What have we learned today? A lot, I hope. But first and foremost: Don't believe everything you read. Especially if the conclusion is extremely unbelievable and the evidence consists of large amounts of gibberish. That shouldn't be too hard to remember. Update, April 15, 2013: I am of course honored that one of Sherwin's firm believers have featured this review on his blog, calling it "pretty good". I appreciate the compliment. However, he concludes that my analysis is flawed by my "assumption that Old Norse should look and sound like modern Norwegian". I do have trouble following that logic. Nowhere in my review do I state or assume that Old Norse "looks and sounds like" modern Norwegian. Quite the contrary, I point out that Sherwin himself seems oblivious to the fact that the two are truly distinct languages, although they are closely related. It is perhaps nessecary to point out to readers not familiar with Scandinavian languages that my above grammatical analysis as well as the examples provided in closing--all demonstrating the vast gap between Sherwin's Old Norse phrases and actual Old Norse as it is found in every other written source of the now-extinct language--are based on Old Norse which I have studied at university level and not modern Norwegian, which is my native language. I will gladly listen to anyone who can convince me that I do not know the difference between the two. In my own book, 500 Years of Viking Presence in America (Barnes & Noble), I triangulated Linguistic, Biological, Historical, Artifacts, Climatological, Anthropological, Geographical, DNA, Cultural, and Christian Influence of Norse Vikings on Native American Indian Cultures from 1000 to 1500 Anno Domini. I did find many of Sherwin's comparisons of Algonquin and Old Norse to indicate centuries-long interactions between the two cultures, much like the cognates in Old Norse and Old English (more than 1000 words). I did not consider the linguistic similarities alone, however. The overall evidence from all disciplines is compelling, and further DNA research is most promising to reveal the connections reported. wow.. thanks for this review.. awesome post..!! Great job. Sherwin's norse seems like a swede's pretend icelandic. I bet the word laagan was tp be a cognate to lakan (sheet of fabric) in modern swedish. I do see that you have the 17th century MYTH in your head. You and the MYTH imply there were no Norse speakers in America. Like the MYTH, you are not valid. Those people are called the MISSISSIPPI culture. The SHAWNEE language evolved tor four hundred and fifty years before the people in the LENAPE migration refreshed the Old Norse words. During the 18th century the English activily suppressed Norse things by omitting the from textbooks. In the beginning of the 19th century the last known LENAPE history, created in Norse, was passed into English hands via a foreigner. By that time the original Old Norse language had evolved into Algonquin for nine centuries. You do not give Sherwin the credit he deserves for showing that OId Norse was the origin of the Algonquin Language. So you still defend the MYTH: There were no Norse in America. I have a different opinion.